SCORES & OUTDOORS: Is there anything in this world more annoying than a house fly? Is there anything in this world more annoying than a house fly? – well, maybe except for Fran Drescher. We have seen an inordinate infestation of house flies this summer. At camp, they are uninvited guests to outdoor cookouts, and even find their way indoors to, again, annoy us to no end. At the office, we had a fly hatch last week that rivaled the Allied invasion of Normandy on D-Day. Flies just buzzing around our heads, work stations, and even during lunch. Literally, hundreds and hundreds of flies. The house fly, Musca domestica, is believed to have evolved in the Cenozoic* era, possibly in the Middle East, and has spread all over the world as a companion of humans. They are present in the Arctic Circle, as well as in the tropics. It is present on every continent. The adults feed on a variety of liquid or semi-liquid substances, as well as solid materials which have been softened by their saliva. They can carry pathogens on their bodies and in their feces, contaminate food, and contribute to the transfer of food-borne illnesses. Add the fact they are physically annoying, they are considered pests. Each female house fly can lay up to 500 eggs in a lifetime, in several batches of about 75 to 150. The eggs are white and are deposited by the fly in a suitable place, usually dead and decaying organic matter. Within a day, the larvae or maggot, hatch from the eggs. The larvae avoid light; the interiors of heaps of animal manure provide nutrient-rich sites and ideal growing conditions, warm, moist and dark. At the end of their fourth instar, the larvae crawl to a dry, cool place and transform into pupae. Pupae complete their development in from two to six days in warmer climates, and up to 20 days in cooler areas. When the metamorphosis is complete, the adult fly emerges from the pupa. Having emerged, it ceases to grow; a small fly is not necessarily a young fly, but is instead the result of getting insufficient food during the larval stage. Females normally mate only once and then reject further advances from males, while males mate multiple times. House flies actually play an important ecological role in breaking down and recycling organic matter. Adults are mainly carnivors with their primary food being animal matter, carrion, and feces, but they also consume milk, sugary substances, and rotting fruits and vegetables. Adult flies are durial (active during the day) and rest at night. If inside a building after dark, they tend to congregate on the ceilings. In cooler climates, they hibernate through the winter, emerging in the spring when the weather warms up, and search for a place to lay their eggs. House flies have many predators, including birds, reptiles, amphibians, various insects and spiders. Flies are definitely a nuisance, but they are disliked principally because of their habits of contaminating food. However, fly larvae are as nutritious as fish meal, and could be used to convert waste to feed for fish and livestock. The ability of house fly larvae to feed and develop in a wide range of decaying organic matter is important for recycling of nutrients in nature. This could be exploited to combat ever-increasing amounts of waste. Harvested maggots could be used as feed for animal nutrition. 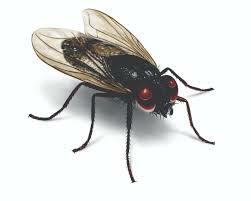 House flies can be controlled, to a certain extent, by physical, chemical or biological means. Flies have been used in art and artifacts in many cultures. In the early 20th century, Canadian public health workers believed the control of flies was important in controlling the spread of tuberculosis. Flies were targeted in 1916 when a polio epidemic broke out in the eastern United States. The disease control continued with the extensive use of insecticide spraying well into the mid-1950s. During World War II, the Japanese worked on bombs which consisted of two compartments, one with houseflies and another with a bacterial slurry that coated the flies prior to release. Vibrio cholerae, which causes cholera, was the bacteria of choice, and was used in China in Boashan in 1942 and in northern Shandong in 1943. The ensuing epidemic killed 60,000 people initially, with a final count of 200,000 dead. In the 1970s, the aircraft modeler Frank Ehlig constructed miniature balsa-wood aircraft powered by live houseflies. Studies with tethered house flies have helped in the understanding of insect vision, sensory perception and flight control. That seems to indicate the value of biodiversity, given that even those considered by humans as pests have their place in the world’s ecosystem. *The Cenozoic Era, meaning “new life,” is the current and most recent of the three Phanerozoic geological eras, following the Mesozoic Era and extending from 66 million years ago to the present day. The Cenozoic is also known as the Age of Mammals, because the extinction of many groups allowed mammals to greatly diversify so that large mammals dominated it. The continents also moved into their current positions during this era. – Wikipedia. http://townline.org/wp-content/uploads/2016/06/TownLineBanner-1030x206.jpg 0 0 Roland D. Hallee http://townline.org/wp-content/uploads/2016/06/TownLineBanner-1030x206.jpg Roland D. Hallee2018-09-05 15:11:592018-09-06 16:53:33SCORES & OUTDOORS: Is there anything in this world more annoying than a house fly?